Jack DiFalco and Janeane Garofalo. Photo by Joan Marcus. Celia Weston and Lili Taylor. Photo by Joan Marcus. Certainly there is no scarcity of new plays about death and dying this season on the New York stage. Owing to both young and established playwrights the subject continues to be explored in increasingly innovative and sometime even unorthodox ways, such as in Branden Jacob-Jenkins’s thrillingly inventive Everybody, or in the absorbingly meditative tragicomedy Wakey Wakey, by Will Eno. Unlike these recent offerings, Marvin’s Room, written in 1990 by Scott McPherson, is a rather conventional play with a rather conventional structure. While it may have augured well for its creator, who died in 1992 at age 33 after receiving several major awards, it seems to have lost much of its vigor in the intervening decades. Bessie (Lili Taylor) is Marvin’s selfless daughter, a saint-like figure who has devoted her entire existence to caring for her dying father, bedridden and on the point of death for now almost two decades. 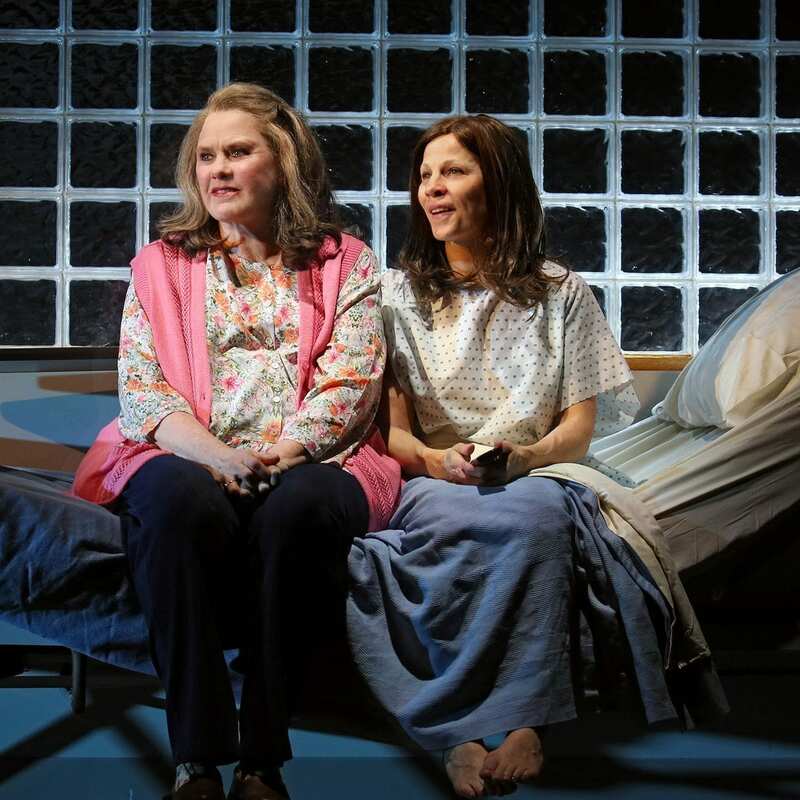 She’s also had to endure a double whammy in the form of Ruth (the wonderful Celia Weston), Marvin’s soap-opera addicted, aging sister who herself struggles with a host of physical ailments. Ruth is sweet, hapless and very needy, and fails to be of any help to Bessie, even when asked to perform the most basic tasks. But there is no limit, evidently, to Bessie’s selflessness, who endures every awful hurdle set on her course with such unparalleled grace she would compare favorably even against Mother Theresa. In an effort to lighten the mood permeating this somber background, McPherson chose to introduce a certain amount of levity into the proceedings, most notably in Ruth’s character, whose electrical implants, designed to alleviate her disabling back pain, also keep opening and closing the garage door every time she switches them on. Her ineptitude is matched by the family doctor, who often misplaces his instruments or can’t recall their names, and swats cockroaches with magazines he then offers to Bessie as reading material. While the writer’s choice to introduce mildly comedic elements is commendable, this production, directed by the otherwise extremely talented Anne Kauffman (Marjorie Prime, A Life) jarringly turns these moments into incongruous variety skits, ostensibly aiming to achieve cackles where quite chuckles would have been more appropriate. McPherson – who was a stage performer before turning to writing – came of age, artistically, during the AIDS epidemic, performing in a Chicago production of The Normal Heart in the early ’80s and eventually caring for his dying partner while having been diagnosed himself with AIDS. The harrowing background of the epidemic, as well as his own traumatic personal experience, weigh heavily on the play and in Bessie’s character, who we soon learn is struggling with leukemia. The caretaker is dying: it is the kind of sledgehammer turn of events that could push most plots into mawkish territory if not expertly handled, and unfortunately this production makes such a studied effort to avoid any emotional overindulgence that it turns the play into a rather bland effort. In particular, the relationship between Bessie and her estranged sister, Lee (Janeane Garofalo) rings especially hollow. The opposite of Bessie, Lee is a self-absorbed, egotistical mother of two who long ago decided not to waste her life caring for Marvin. She is back in town to get tested, along with her two kids, as a possible donor for a bone marrow transplant for Bessie. In spite of the subject’s intensity, no exchange between the two sisters ever achieves much emotional resonance. There appears to be no chemistry between the two actors, and their dialogue, as rife with repressed resentment and misplaced guilt as any dialogue could be, is delivered with such understatement to render the feelings we are meant to recognize, and respond to, almost inconsequential. 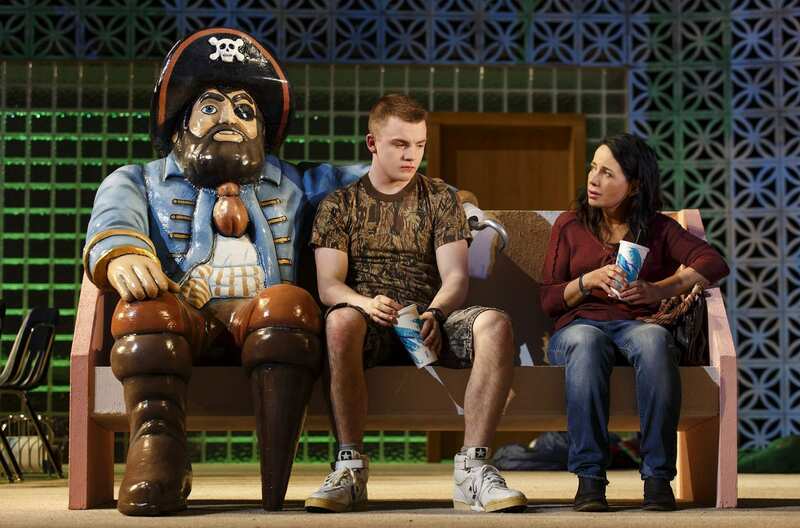 Surprisingly, it is with the second youngest actor in the cast that this production achieves its most poignant moments. Hank (Jack DiFalco) is Lee’s troubled son, temporarily out of the mental institution where he has been confined since setting fire to his own house. He desperately craves Lee’s love and attention, which she steadfastly withholds, much as she withheld love and support from the rest of her family for the past 17 years. It is in the scenes in which Hank interacts with Lee and, separately, with Bessie, that we finally manage to connect more deeply with the drama’s characters and their plight. Marvin, confined to his room and out of sight for the entire length of the play, is still alive when the curtain drops. Cast: Janeane Garofalo, Lili Taylor, Celia Weston, Carman Lacivita, Jack DiFalco, Nedra McClyde, Luca Padovan and Triney Sandoval. Set design by Laura Jellinek; costume design by Jessica Pabst; lighting design by Japhy Weideman; sound design and original music by Daniel Kluger.